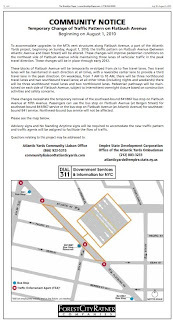 On July 26, the Empire State Development Corporation announced a temporary (aka 17-month) closure of one lane of Flatbush Avenue between Atlantic Avenue and Dean Street, to begin on August 1. Forest City Ratner even bought the back page (right) of the Brooklyn Paper to announce the plan, as well as an interior page of the Courier-Life. 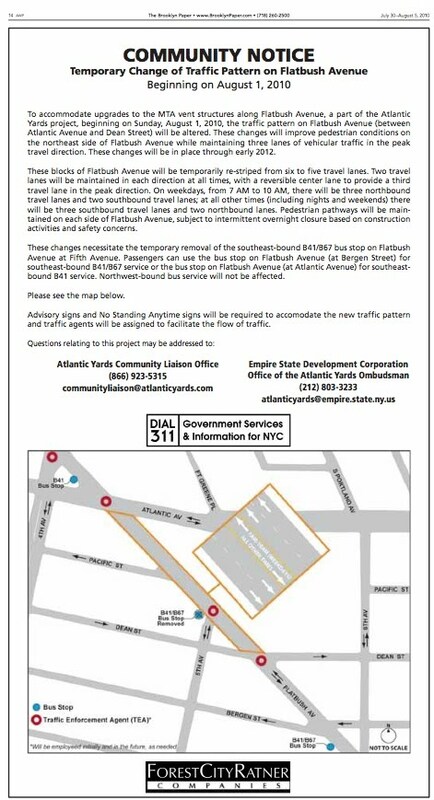 Today, however, the ESDC issue an updated community notice (below), announcing the work would begin instead on August 20. Why? The contractor was not ready to commence work, the ESDC said in response to my query. I assume that refers to the contractor working on Metropolitan Transportation Authority vent structures. Also below: the two-week look-ahead construction alert issued today.